Christopher Andrew "Chris" Sabo (born January 19, 1962) is a former third baseman in Major League Baseball who played for the Cincinnati Reds (1988–93, 1996), Baltimore Orioles (1994), Chicago White Sox (1995) and St. Louis Cardinals (1995). At 6'0" and 180 lb (82 kg), he batted and threw right-handed. Sabo was born in Detroit, Michigan, the son of a plumber and a waitress. The Sabos lived in Rosedale Park, three blocks from the 1968 Championship Detroit Tiger Willie Horton. Sabo attended Detroit Catholic Central High School. In high school, he excelled as both a hockey goalie and a golfer in addition to being one of the area's best baseball players, twice earning all-state honors. Sabo played hockey on two national championship 17-and-under teams and, before enrolling at Michigan, also played hockey as a goaltender in one game in the Ontario Junior Hockey League for the Niagara Falls Flyers in the 1979–80 season. As a senior, he was torn between pursuing a hockey career or a baseball career but ultimately chose baseball and a scholarship to the University of Michigan despite being drafted in the 1980 Major League Baseball Draft by the Montreal Expos. A third baseman, Sabo was a key component on a strong Michigan team that finished third in the College World Series in 1983, a season in which Sabo was joined as a starting infielder by future Reds teammate and Baseball Hall of Famer Barry Larkin. That season, Sabo earned first-team All-American honors from The Sporting News and Baseball America. Sabo was selected by the Cincinnati Reds in the second round of the 1983 Major League Baseball Draft. Sabo spent five seasons in the Reds' minor league system, during which he never put up impressive numbers, although in two of those seasons he was named the Most Valuable Player of his team. By 1988, he was given little chance of making the big-league team out of spring training, but his ability combined with his grit and hustle was reminiscent of, and endeared him to, Reds manager Pete Rose And with Buddy Bell starting the season on the disabled list and the Reds needing a third baseman, Sabo stepped in and was the opening day starter. Batting eighth, Sabo collected his first hit, stolen base and run scored in the seventh inning and made a run-saving play on defense in the Reds' 5–4, 12-inning win over the St. Louis Cardinals. Sabo continued to make the most of the opportunity throughout the season. On April 18, he hit his first career home run, a solo shot off San Francisco Giants pitcher Mike Krukow. For the season, he posted a .271 average with 11 home runs and 44 RBI, pounded out 40 doubles and also stole 46 bases. He won the National League Rookie of the Year Award and quickly became a fan favorite with his hustle and determination punctuated by his flat-top haircut and ever-present wraparound protective eyeglasses commonly known as Rec Specs. That season, Sabo was featured on the cover of Baseball America and The Sporting News and was the subject of a feature article in Sports Illustrated. After a forgettable 1989 campaign in which he was limited to 82 games, Sabo returned to help lead the Reds to a World Series Championship as he batted .270 with 25 home runs and 71 RBI. Sabo also had an outstanding World Series, batting an astounding .583 with nine hits in 16 at bats, including two home runs and five RBI plus two walks. At the Reds' Fountain Square victory celebration, he famously grabbed the microphone and bellowed to the cheering crowd, "We've got the rings, we've got the money, we've got everything!" He had his most productive season in 1991, posting career-highs in batting average (.301), home runs (26), RBI (88), hits (175) and games played (153). Sabo made the National League All-Star team in 1988, 1990 and 1991. After injuries limited his play in 1992, his production dropped off drastically. Sabo never again hit above .260 nor would have more than 10 steals in a season. Baltimore signed him in 1994 where he endured another injury-plagued season and then split 1995 between Chicago and St. Louis. His final season was in Cincinnati in 1996. His homecoming did not go as well as he had hoped. In July, Sabo shattered his bat which was filled with cork. As a result of the incident, Sabo received a seven-game suspension. Sabo maintains that he never corked a bat in his life, claiming that the bat in question belonged to another player (whom he would not name). The credibility of Sabo's defense was enhanced by the fact that he broke his original bat while hitting a foul ball during the at-bat in question coupled with the fact that Sabo decided not to replace the corked bat (which had been provided by a batboy) even though the bat was thought by the game's play-by-play crew to have cracked after Sabo hit another foul ball during the penultimate pitch of the at-bat. Sabo further argued that his performance that season (three home runs in 52 games) was hardly "an endorsement of the cork industry." In a nine-season career, Sabo hit .268 with 116 home runs and 426 RBI in 911 games. Also an excellent fielder, Sabo led National League third basemen in fielding percentage in 1988 and 1990 and was second in 1991. Reds manager Pete Rose gave Sabo the nickname "Spuds" during his rookie season in 1988, citing a resemblance to a bull terrier character in Bud Light commercials named Spuds MacKenzie. Sabo lives in Sarasota, Florida with his wife, Susan, whom he married in 1989, and their three daughters Annie, Brooke, and Olivia. Sabo is currently a baseball coach at IMG Academy in neighboring Bradenton. 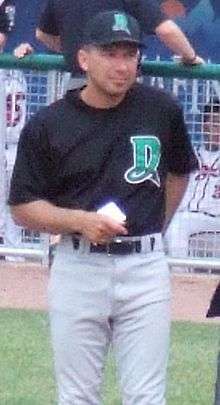 He has served as a coach in the Reds' minor league system for the Advanced Rookie Billings Mustangs and Class A Dayton Dragons. He has also served as an assistant coach for the University of Cincinnati. In 2009, he began attending the Northern Kentucky University law school. Sabo was inducted in the Cincinnati Reds Hall Of Fame, along with Big Red Machine reliever Pedro Borbón and 19th-century pitcher Tony Mullane, on July 17, 2010. The Reds gave away Chris Sabo bobblehead dolls to fans in attendance that evening. He is an avid golfer, plays in celebrity golf tournaments and is a member of Kenwood Country Club in Cincinnati. He is good enough to have qualified for several major United States Golf Association tournaments. He is also a popular figure at Reds reunion events. ↑ "Late-bloomer Chris Sabo gives Reds refreshing rookie star". CSMonitor.com. 1988-08-15. Retrieved 2015-05-13. 1 2 3 4 5 "Christopher Andrew Sabo | reds.com: Hall of Fame". Cincinnati.reds.mlb.com. Retrieved 2015-05-13. ↑ "University of Michigan Athletics - Baseball". Bentley.umich.edu. Retrieved 2015-05-13. 1 2 3 4 "Chris Sabo Statistics and History". Baseball-Reference.com. Retrieved 2015-05-13. ↑ "Chris Sabo Minor League Statistics & History". Baseball-Reference.com. 1962-01-19. Retrieved 2015-05-13. ↑ "April 4, 1988 St. Louis Cardinals at Cincinnati Reds Play by Play and Box Score". Baseball-Reference.com. 1988-04-04. Retrieved 2015-05-13. 1 2 "Same old Sabo". Reds.enquirer.com. 2001-07-15. Retrieved 2015-05-13. 1 2 "Man on the Corner: An Interview with Chris Sabo | Chris Sabo's Goggles". Chris-sabos-goggles.com. Retrieved 2015-05-13. ↑ "Former Red Chris Sabo talks golf, baseball and the ever-seeing eye of people with cameras (video)". AL.com. Retrieved 2015-05-13. ↑ "Chris Sabo sets the bar". The Northerner. 2009-10-14. Retrieved 2015-05-13. ↑ "Reds Hall of Fame Gala honors history, inductees | Cincinnati.com | cincinnati.com". Archive.cincinnati.com. Retrieved 2015-05-13.